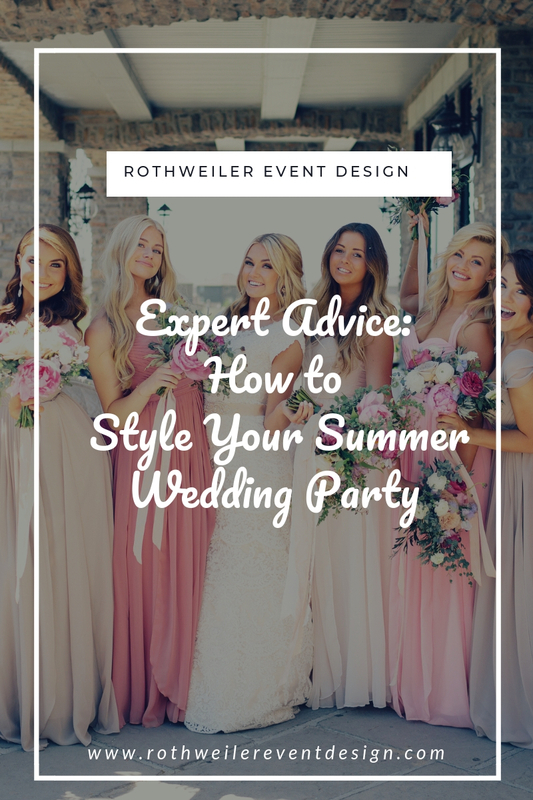 How to style your Summer wedding party with hot trends and gorgeous looks, really is as easy as it sounds. It doesn’t matter if you want to embrace the season or forget it altogether either! There are no rules to designing your wedding day, and that includes what your wedding party wears. Of course, let’s not go completely insane and ask the bridesmaids to wear faux fur if the big day is in August! Maybe you already know what you want the bridesmaids to wear, but can’t figure out the best option for the groomsmen. Or, maybe you’re just not sure what colors or styles work best together. Worried that your wedding party might look like a throwback to prom? Whatever your concerns are, I’ve put together a bunch of colors and combos for every Summer wedding party. Get ready to find the look you love and learn exactly where to shop right in this blog! Normally, I’m not a huge fan of short bridesmaids dresses. If your girls have to kneel in a church, they’re probably not a great idea. 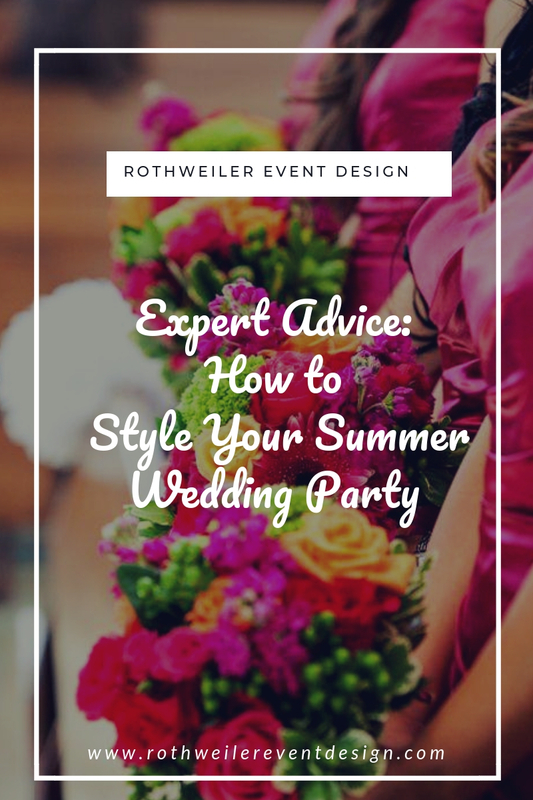 Summer weddings, however, are a great time to consider dresses with a shorter hemline…especially if you’ll be outside during any part of the celebration. Short bridesmaid dresses often get a bad reputation as being too informal. If you’re having a black tie wedding and your female guests will be wearing long dresses, I wouldn’t recommend going the short route for your bridesmaids. The dress code of a wedding should either be the same as the wedding party, or slightly less formal. Your wedding party shouldn’t look like they don’t fit in with everyone else in attendance, make sense? If you are going the “black tie” route though, and still want to consider short bridesmaid dresses, there are always options. Going with a more classic look, whether that be the neckline style or even the fabric, is a great way to keep the formality of the dress code. 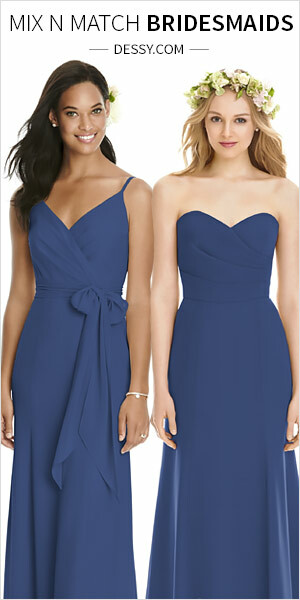 A great way to achieve that formal look with a short bridesmaid dress is to have the neckline mimic the bride’s gown. For instance, if the bride is wearing a sweetheart neckline, look for bridesmaid dress options that also have a sweetheart neckline. The reason this works, is the wedding gown is typically representative of the overall wedding vibe. And if that vibe is “formal”, mimicking details like the neckline is a great way to make that vibe seamless. Of course, it’s just as important to consider what the groomsmen will wear when deciding on the wardrobe for your bridesmaids. 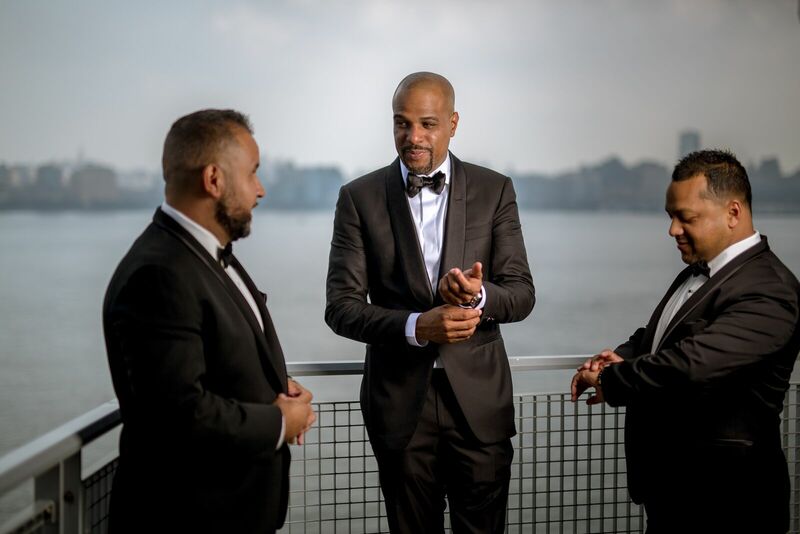 I know I just said there are no rules and do what you want, but….if you’re having a black tie wedding, then the groom and groomsmen should be in black tuxedos. 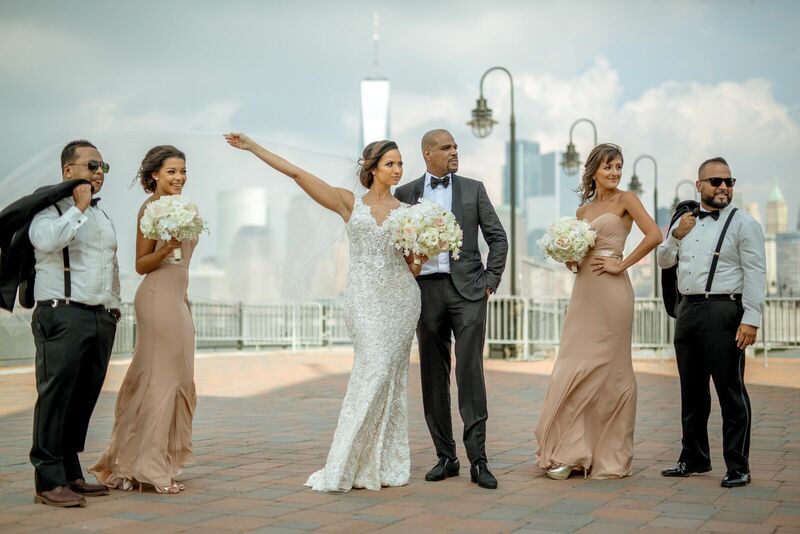 If your bridesmaids are in short dresses, along with selecting more formal options, you’ll love how the look comes together with groomsmen in tuxedos. Black tuxedos are the standard in formal wedding wardrobe. That doesn’t mean you can’t add a little personal style or change up a few details though. Since short bridesmaid dresses tend to feel a little less formal than black tie, if you feel a full black tuxedo will just be too much of a contrast, you aren’t stuck. Change out the bow-tie for a long black tie instead, or add some color block cuff links to make the tuxedos less stuffy and more fun. Our friends at Dessy have an incredible selection where you can mix and match and also have the option between renting and buying. 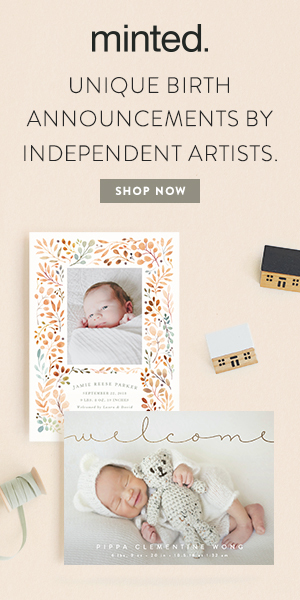 You can check them out right here to get started. If you’re worried about a tuxedo just being too heavy for a Summer wedding, be sure to check out the light weight options! 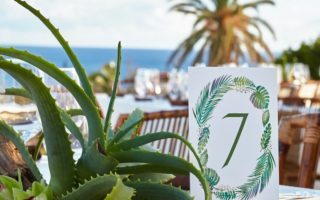 Not going the black-tie route for your Summer wedding? 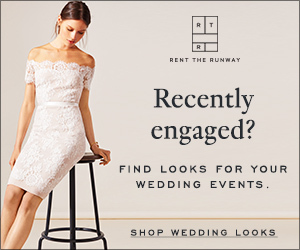 Your list of wedding wardrobe options just got a whole lot longer, my friend! Talking about colors, there are certain ones that make us think of Summer right away…they’re all bright and sunny for the most part. Does this mean you can’t go for a jewel toned bridesmaid dress? Hell no! You can do whatever (or close enough) you want because it’s your wedding. If you’re planning for your wedding to be the most fun anyone’s ever had, then everyone needs to wear something they can have fun in. Your wedding party is going to be with you from sun up to way later than sun down. While you can’t just have everyone show up in sweats and a hoodie (or shorts and flip flops since it’s Summer and all), some wedding wardrobe options are totally more fun than others. 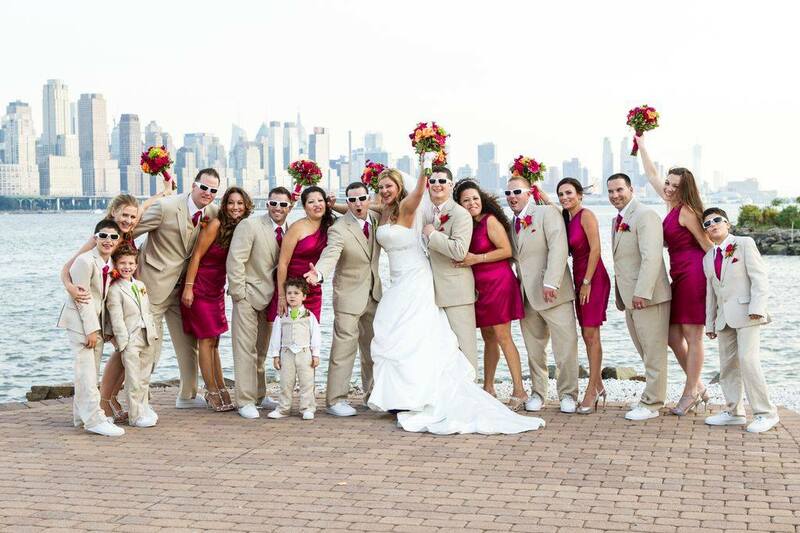 I love the look of short, fuchsia bridesmaid dresses for a Summer wedding, paired with khaki suits for the groomsmen. 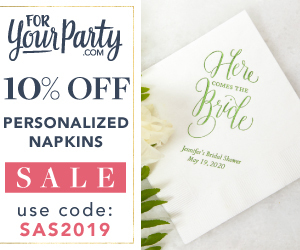 Let’s face it, bright colors are synonymous with Summer weddings, and whether you go for a bright pink, yellow, green or any other color, you really can’t go wrong. 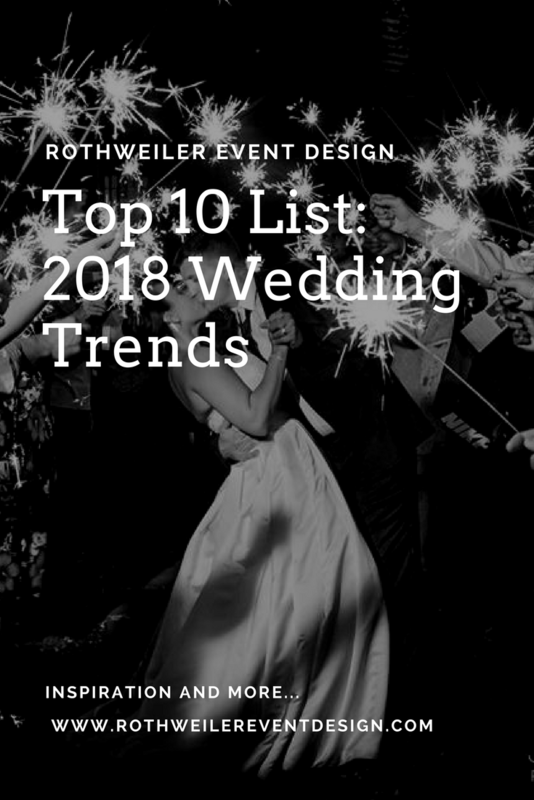 The brighter colors can still be formalized if you’re careful with the style of the dress and you have your groomsmen wearing black tuxedos or deep gray tuxedos. Here’s the thing about black tuxedos in the Summer though: it’s really effing hot out and the groomsmen will hate their lives (unless you grab those light weight options I mentioned earlier). Plus, they’ll probably ditch their jackets any chance they get. This goes back to the wardrobe being something your wedding party will have fun in. Khaki suits aren’t formal whatsoever, but if neither is your wedding, then game on! 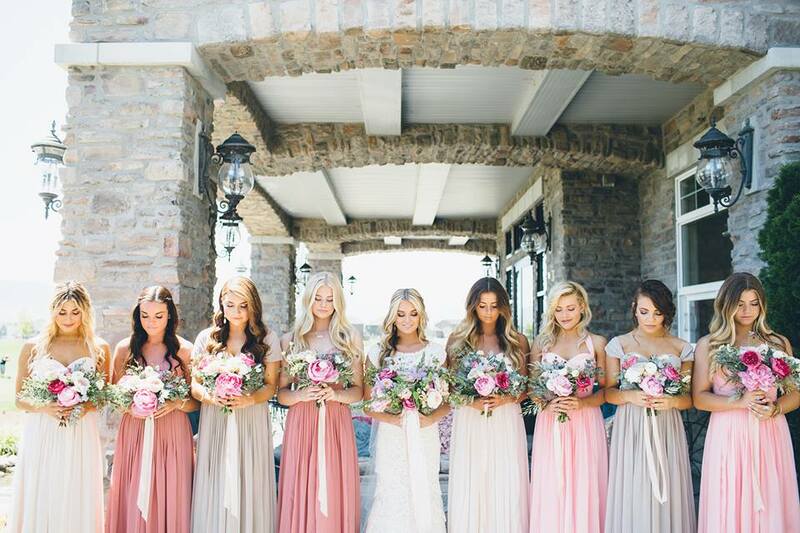 A bright bridesmaid dress acts a lot like an accent color on a wall in your home. Putting anything bright, busy, or otherwise loud next to it, and you’ve got a mess. Keep the look simple with a khaki option and spice it up with coordinating ties if you want. Blue has become a red hot color for Summer weddings. 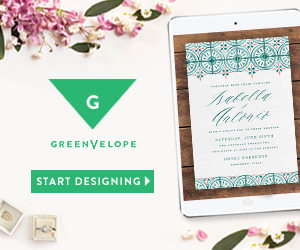 The color is a favorite in general, but we’re seeing it more and more in the wedding world. My couples first started asking me about it for the groom and groomsmen though, because it’s considered “less formal”. Of course, what isn’t less formal than a black tuxedo? There was a big push-back to formal weddings a few years back when the rustic chic barn wedding trend basically took over. Like with a Summer wedding, it’s not always easy to imagine using black tuxes for a barn wedding. Between the non-formal trend and the “everyone’s getting married on a farm” one, blue emerged as the front runner for men’s wedding wardrobe. Enter those charcoal and gray blues that are perfect options for groomsmen in Summer weddings. The color is great because it isn’t so pale that you’re entering baby blue Easter land, but it’s not so dark that you’re wondering if it’s black or navy. Just like with a tuxedo you try to make less formal, you can do the same thing by pairing this suit with a fun long tie. You can pick up the color or colors the bridesmaids are wearing, or go with something fun like a paisley print. 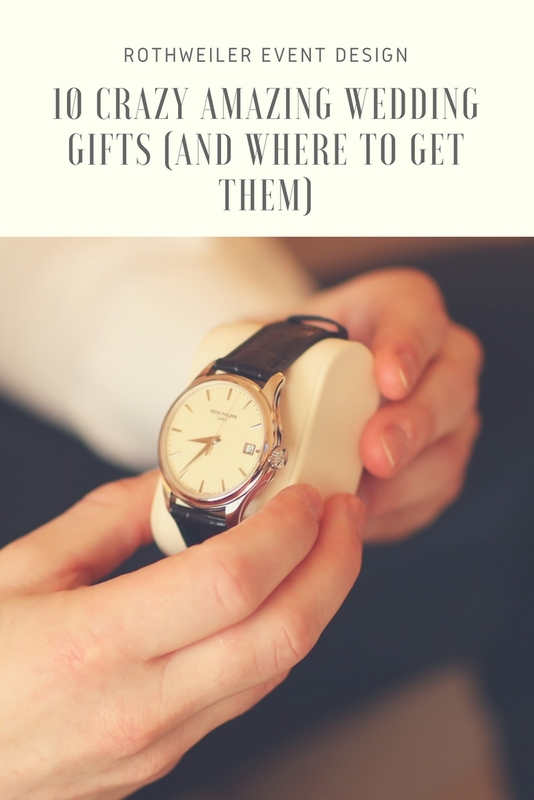 Looking for fun groomsmen accessories? 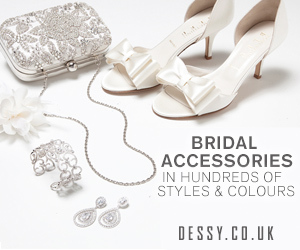 Check out all of the options from our friends at Dessy now! I’ll talk more about using this color with mismatched bridesmaid dresses later in the blog, don’t you worry. First, I want to mention the less obvious, but oh so pretty combo of charcoal blue suits with blue bridesmaid dresses. Yes, we’re going monochromatic…sort of. I’ll admit it, when I first saw this look come together, I was shocked. 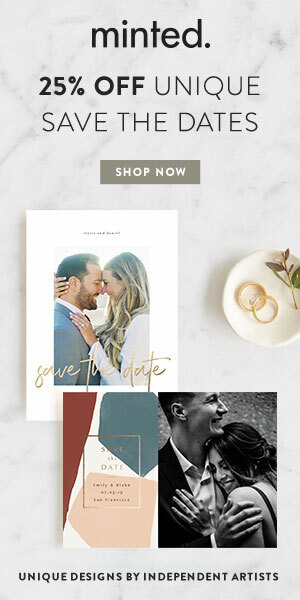 You couldn’t convince me that blue and blue would look anything but disgusting…proving that even a professional wedding planner can’t “see the big picture” with how it will all look together. I am reminded of that scene from “Devil Wears Prada” where Miranda basically shreds Andi with all the different types of blue that are out there. If you don’t know what scene I’m talking about or you’ve never seen the movie, then we really cannot be friends in real life. Anyway, dusty blue looks just breathtaking against the deeper and grayer blues. 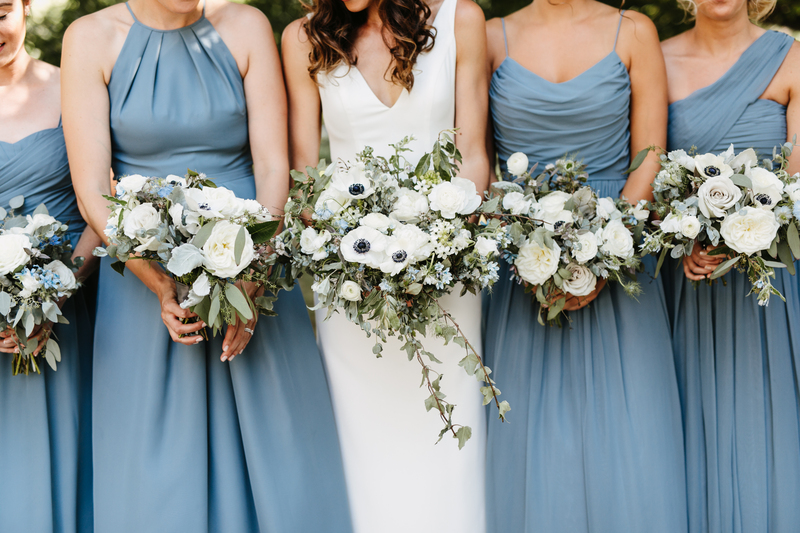 Whether the blue suit has a lot of texture, or it’s got a smoother look to it, you can’t go wrong with the pairing of dusty blue bridesmaid dresses. If you’re thinking of going down this road, be sure to compare swatches of the dress options and the suit jacket options. It’s not super easy to mess this combination up, but a little extra homework never hurt anyone. Not sure if the colors will work? 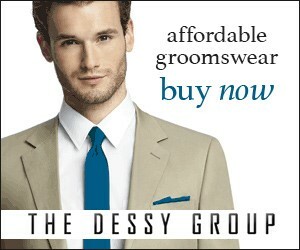 A safe way to go is to choose a darker blue for the groomsmen, while keeping the bridesmaids in that dusty blue color. This will also keep you from creating a super monochromatic look if you’re trying to avoid that. 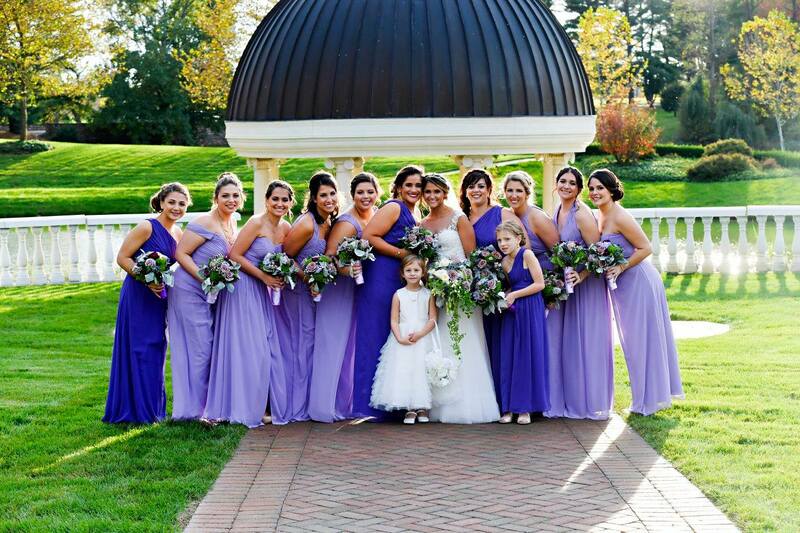 Mismatched bridesmaid dresses are a trend, have been a trend, and are going to be a trend for a long time. Trust me, I am psychic about this kind of stuff. Here’s the thing with this trend though…so many brides are terrified of it. One of the pictures hanging in my office has 8 bridesmaids in it and 4 different dresses (and yes, it’s in this blog further down). The styles are the same aside from the necklines, but there are 4 different colors. The reason I mention this picture, is because everyone that comes into my office comments on how gorgeous the dresses are. I have soooo many brides tell me that is exactly what they want. Fast forward to selecting bridesmaid dresses and they just can’t do the mismatched look. Why? Because it’s harder than it looks. Part of the challenge is finding dresses that all look good together, and that’s the easy part. 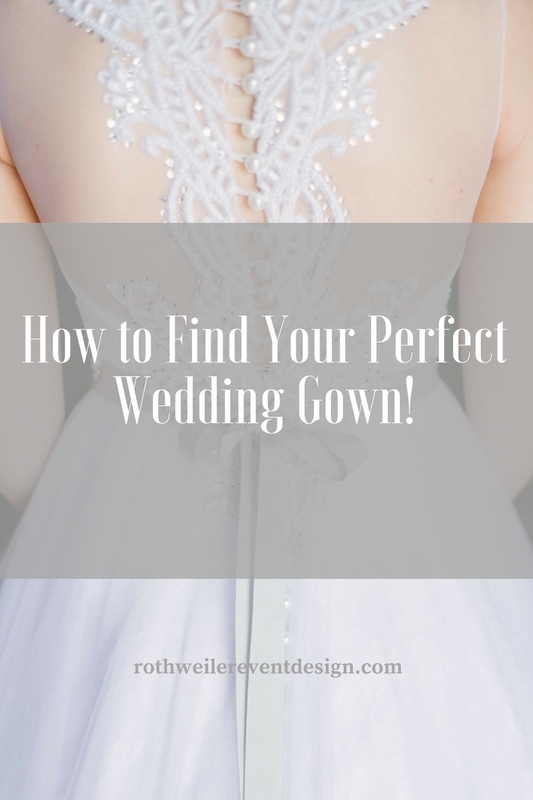 The hard part is getting your bridesmaids to all love the dress that they are wearing, and making sure the right body type is in the right dress. 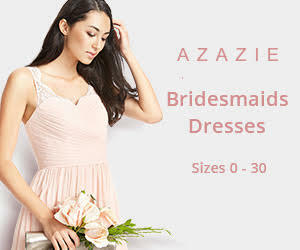 Making sure your bridesmaids are comfortable in their dresses is essential, and that task is hard enough to accomplish without selecting 17 different types of dresses. So, keep things easy by keeping things simple. You don’t have to pick a different dress for every bridesmaid; in fact, two different colors go a long way and make a big impact. I don’t keep it a secret that I am obsessed with the color purple (the actual color, though I’m a fan of the play too). 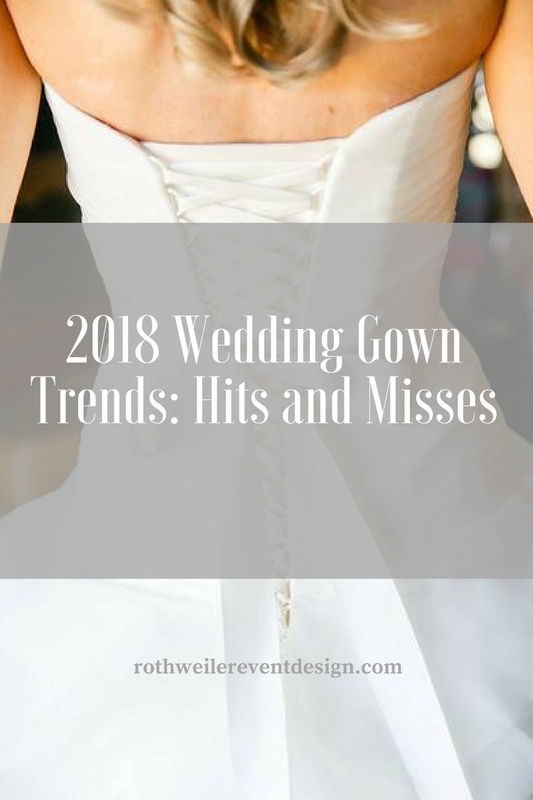 Purple screams royal, romance, and elegant, and if you can’t relate to any of those words for your wedding, then we might have a whole other problem to deal with…. Anyway! 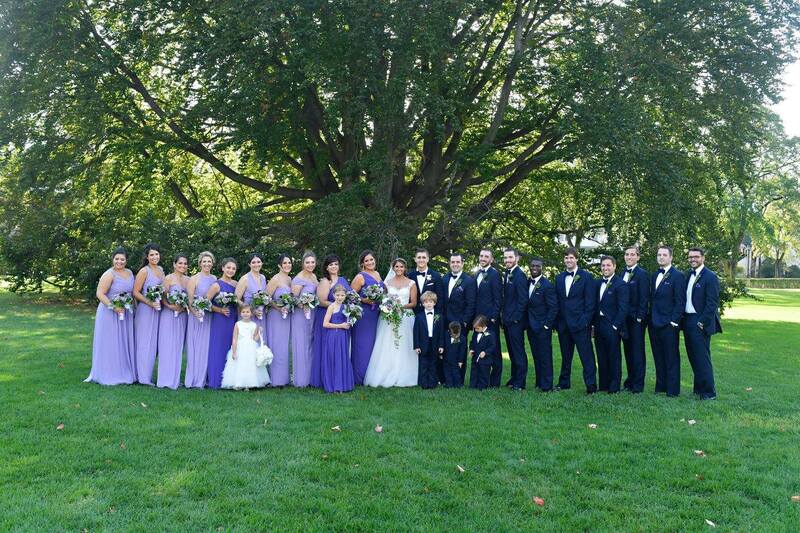 Plenty of people shy away from using purple at their wedding because it’s not considered a safe color. 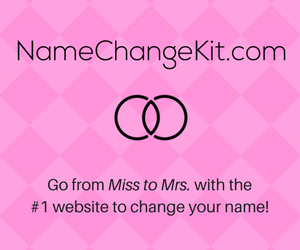 It’s bold and powerful and I hear from lots of brides that think it might be too much. 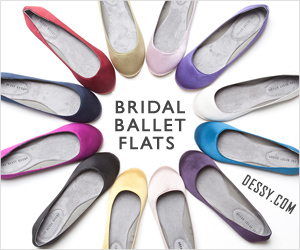 This makes it the perfect color to use for the mismatched bridesmaid dress trend! Keeping it simple, pick two different shades of this incredible color and voila: instant gorgeous! Want to add another level to the mismatch? Vary the necklines and let your bridesmaids pick which ones they want. Yes, I just said to let your bridesmaids pick something they want. Screenshot this because it almost never happens. Purple is a great color for Summer and you really cannot go wrong with any shade. Since it is such a strong color, the pairing with a traditional black tuxedo is a no-brainer. 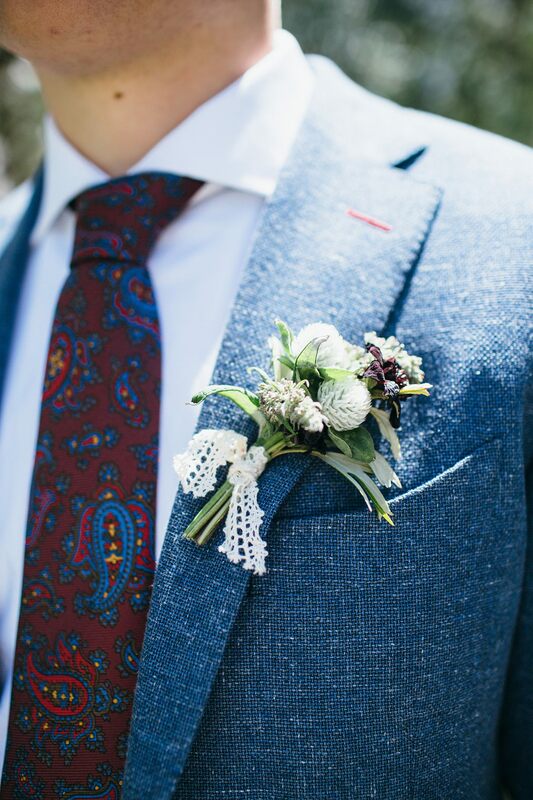 If you want to have some fun with the look, consider a funky pocket square…step up your game and give a different pocket square to each groomsmen to go with the mismatched bridesmaid gown look. Incidentally, if you’re not in love with pocket squares, you don’t have to do them at all. 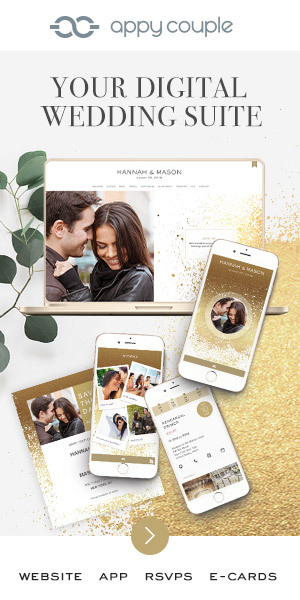 To get a list of all the wedding wardrobe rules you can totally break, be sure to sign up for my mailing list right here so you’ll know when my e-book drops later this year! On the total other end of the wedding wardrobe spectrum of colors, is the family of neutrals. Now, even though the internet lumps pretty much every single color into “neutral” (seriously, check it out…), I’m talking about the ones the rest of the world considers “neutral”. Shades of white, basically. Over the past 2 or 3 years, white has been a primary color in wedding design. Along with white, we started seeing more creams and pale grays, which are all easily paired with plenty of stronger colors. My thought is that this stemmed from the rustic and organic trend that has taken over the wedding world. Meanwhile, these colors work for every style of wedding…so, no, you don’t have to be married on a cow farm if you don’t want to. Summer; when people are tan. Personally, my complexion is lighter than a sheet of paper for all of Winter and the bulk of Spring. Fall? Yup, tan fading and it’s not cute. In Summer though, I could (and do) wear SPF 2000 and I’m still getting enough color where I no longer look like I am dying of some awful disease. What highlights a tan better than paler colors? Nothing, the answer is, nothing. I love the bridesmaid dress options in the color champagne, and they are perfect for Summer weddings. Paler colors can sometimes read as informal, but there are countless ways you can formalize all of them. Champagne is my favorite option for a neutral bridesmaid dress because it has a natural warm undertone. Some shades have more pink in them, some more orange, and some more gold, making this color extremely versatile. If you’re having an informal Summer wedding, this color looks just as amazing on a short bridesmaid dress as a long one. Depending on the fabric, there are ways to make this color sparkle as well. Create the mismatched bridesmaid dress look by having a variety of champagne dresses, ranging from all sequin to a soft all over shimmer. Make the look classic by keeping the design simple and adding a sparkly belt. It should come as no surprise that I’m going to recommend a classic black tuxedo to go with a champagne colored bridesmaid dress. Even if you’re going for a short dress and want to avoid the formal black tuxedo, consider opting out from the bow ties or maybe adding some suspenders. Really, really don’t want to go with black tuxedos? Select a super dark gray and that’ll work just as well. Champagne may be a pale color, but it’s very strong and making it compete with a blue, lighter gray, or even khaki suit will cause a clash. 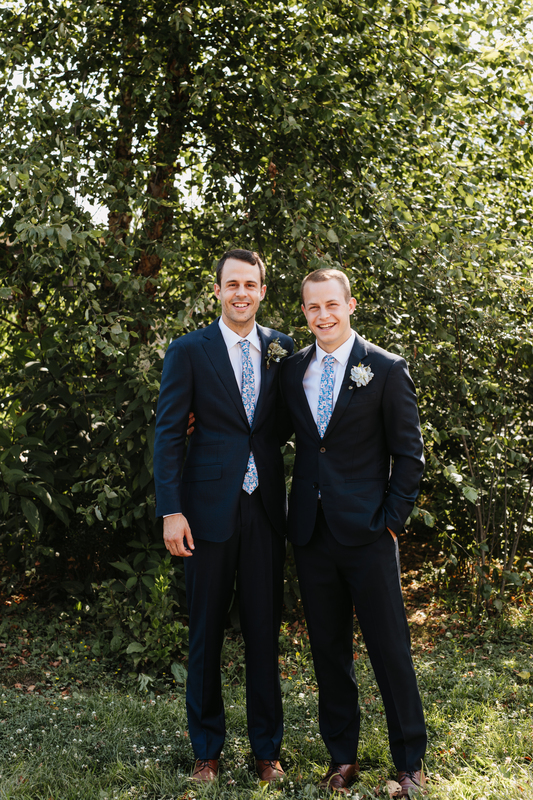 As promised, here I go talking about using that charcoal blue color for your groomsmen. It’s a gorgeous color for really any time of year, but it’s absolutely perfect for a Summer wedding. I already talked about how it works for both the formal and informal weddings, but another bonus about this color is how well it works with a very mismatched bridesmaid dress option. But this blog isn’t about every selection. It’s about the best selection for a Summer wedding. 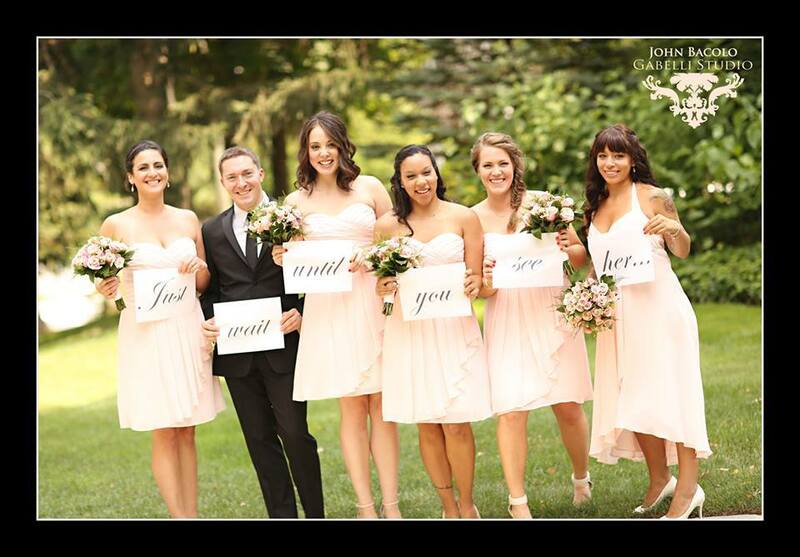 Pink has always been popular for weddings: bridesmaid dresses, flowers, linens, all of it. Pink. Pink. Pink. With grooms getting more involved in wedding planning and brides feeling less obligated to make the day look “girly” by using cotton candy pink literally everywhere, pink usage has changed. Now, it’s not just mixing shades of pink, but mixing pinks with gray, white, and other colors. We still get the soft romance of the color, without feeling like we’re part of some bubble gum sweet 16 party (not that there’s anything wrong with that). A gorgeous look for wedding party wardrobe combines the softness of shades of pink/white/gray with charcoal blue suits. Even with all of that going on, since the colors compliment each other so well, you don’t have to be afraid to go one step further by changing up a detail like the necklines on the dresses. The key to not going overboard here is to stop right there. If you prefer to have mismatched bridesmaid dresses be about the fabric, then stick with one or two colors at most. Looking to create the ombre look? The larger the wedding party, the better it will look. This is not an endorsement for large wedding parties, so please don’t misinterpret what I’m saying. Every year some trends stick around, while others disappear, and we get a few new ones too. But, a wedding is a reflection of the couple and their style. You might not want to go with the trendy looks for your wedding party, and you certainly don’t have to. Perhaps there’s a trend that you love except for one thing or another. Don’t be afraid to put your own twist on a trend and make it your own. 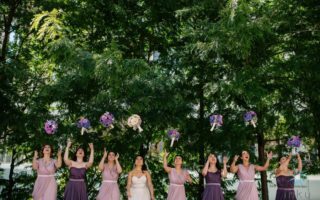 What do you think of the color and style combinations in this blog for a Summer wedding? 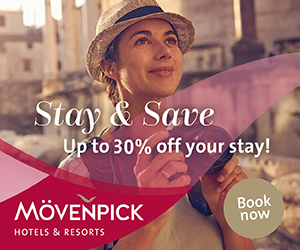 Can you suggest some other options I didn’t mention? 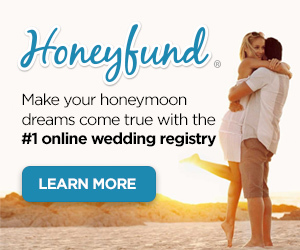 Leave your ideas or even what you’re doing for your own wedding in the comments section below!